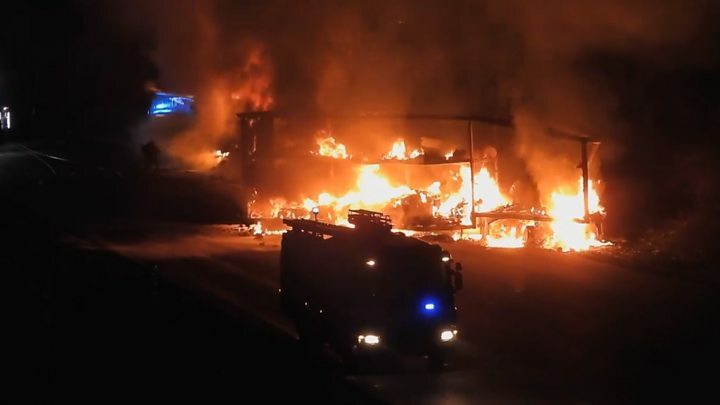 An "intense" blaze that broke out on the M1 when two lorries collided forced the motorway's closure. The crash happened between junctions 21 and 20 northbound in Leicestershire just after 01:00 GMT. Both sides of the motorway were shut for three hours, but the northbound carriageway remained closed while repairs are carried out. Up to two miles of traffic queues were reported during the morning rush hour on Friday. Police said the drivers escaped with minor injuries. The northbound section reopened just after 12:30. Leicestershire Fire and Rescue Service said it sent three appliances to the scene. Ambulance and police crews were also called. Drivers are being urged to use alternative routes.